The ancient villages of Nar and Phu offer a rich Tibetan culture practiced by local Bhotia people easily visible in their daily rituals and beautifully decorated monasteries like Tashi Lhakhang Gompa. Opened since 2002, Nar Phu trekking is perhaps one of the least visited but highly prized trekking destinations in Nepal. 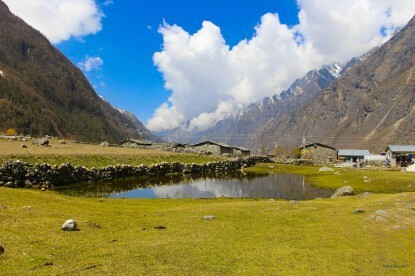 Because of the sensitivity of its age-old culture and pristine nature, trekkers are required a special permit to enter Nar Phu. Nar Phu falls in the trans-Himalayan region beyond Annapurna mountain and comprises of two villages, Phu and Nar. Nar Phu Trekking begins at Chame in Manang passes up the Marhsyangdi River through a rugged and wild landscape and drops down to Kali Gandaki Valley. The ancient villages of Nar and Phu offer a rich Tibetan culture practiced by local Bhotia people easily visible in their daily rituals and beautifully decorated monasteries like Tashi Lhakhang Gompa in Phu village. You will be transported back in time when you visit Nar Phu which is geographically and culturally much closer to Tibet than Nepal. 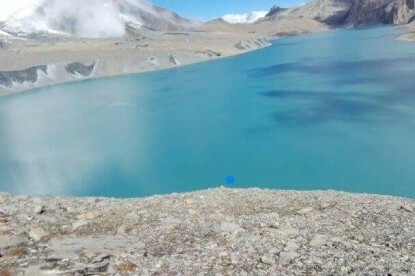 The Kang-la Pass (5314m) is the first adventurous crossing that leads you to Nyeshang village. 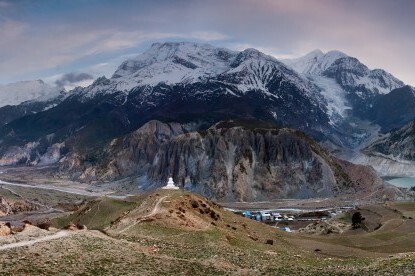 The pass affords a full view of Annapurna ranges and beyond Nyeshang Village are the alpine valleys of vast barren landscape with snowcapped peaks making an impressive backdrop. The highest point of Nar Phu trek is the Thorong-La Pass (5416m), the crossing of which requires proper acclimatization and preparation on the trekkers' part. 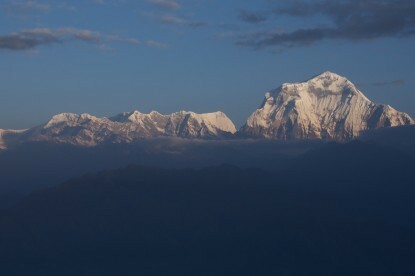 The pass affords a magnificent view of Annapurna ranges, Dhaulagiri (8167m), Manaslu (8163m), Gangapurna (7455m), Tilicho peak (7134m), Nilgiri (7041m), Machhapuchhre (6998m), Lamjung Himal (6986m) etc. 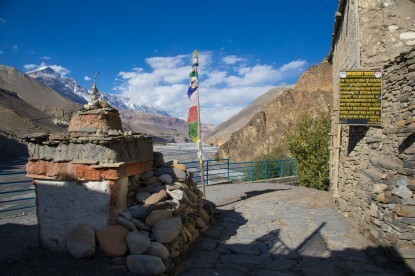 From here you will descend down to the temple of Muktinath (Chumig Gyatsa) on Kali Gandaki Valley and then to the town of Jomsom, known for Thakali community and their sumptuous cuisines. 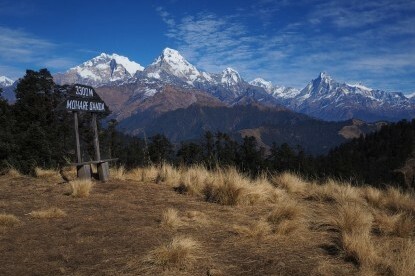 The best time to Nar Phu trekking is either Spring, Autumn or Summer. 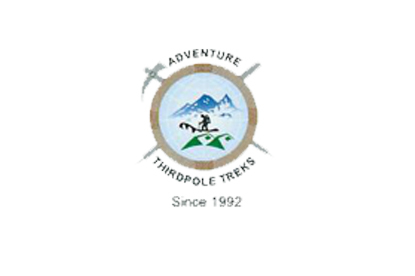 Adventure Thirdpole Trek has been operating Nar Phu trekking for many years with its experienced guides and expertise in handling all necessary logistics and permits. Drive to Besisahar (760m) by bus - 7h. Chamje - Dharapani (1860m) - 6h. Dharapani - Koto (2600m) - 6h. Koto - Singenge Dharmasala (3230m) - 5h30. Dharmasala - Kyang (3820m) - 5h30. Kyang - Phu (4080m) - 5h. Phu - Junam Goth (3550m) - 5h. Junam Goth - Nar (4110m) - 5h. Nar - Ngawal (3660m) via Kang-la Pass (5315m) - 7h. Ngawal - Manang (3350m) - 4h. Manang - Lather (4000m) - 5h. Lather - Thorong Phedi (4510m) - 3h. Thorong Phedi - Muktinath (3800m) via Thorong-la Pass (5416m) - 9h(historical place). Muktinath - Jomsom (2730m) - 5h. Fly from Jomsom to Pokhara - 30 minutes. Drive to Kathmandu by bus - 8h or fly - 35 minutes.